In a large bowl, mix together all ingredients except butter and phyllo dough. Using a pastry brush, brush some of the melted butter on the sides and bottom of an 8-inch square pan. Put a layer of phyllo dough on top of the butter. Brush phyllo with more butter— dough doesn't have to fit neatly into the pan, so just fold it over where needed. Repeat phyllo and butter to make a total of four layers. 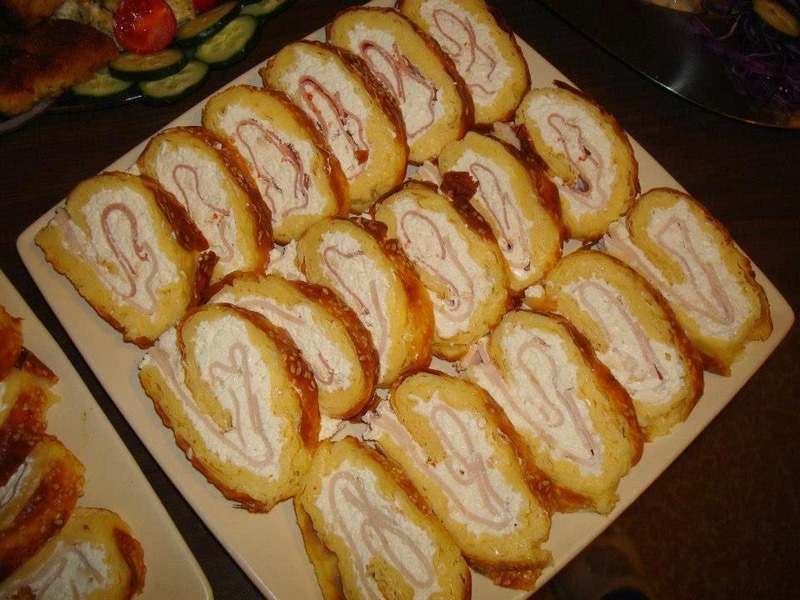 Top with the cheese mixture and ham. Top with more phyllo and butter layers until all phyllo is used. Bake at 350° for 35-40 minutes or until strudel is puffed up and nicely browned. A toothpick inserted in the center through the phyllo and into the cheese will come up clean when strudel is done. Although best served the same day it is baked, leftover slices that have been refrigerated can be heated in the microwave and served hot. Dust top of strudel generously with powdered sugar before serving.